Figure 1. Reticular pigmentation and papules on the axilla. Figure 2. Skin biopsy demonstrating elongated antler-like rete ridges that are hyperpigmented. A 34-year-old woman gave a 10-year history of asymptomatic mottled pigmentation localised to both her axillae (Figure 1) and groins. The pigmentation had a papular element and was persistent. Her mother and sister were similarly affected. Hyperpigmentation of the axillae may be seen in a range of conditions, including the following. Axillary freckling may be seen as a manifestation of neurofibromatosis. Freckles produce mottled pigmentation but not a reticulate pattern. Skin biopsy of a freckle shows an epidermis with a normal architecture, normal numbers of melanocytes and a focal increase in melanin. Axillary lentiginosis is usually localised to one axilla and is characterised by numerous, 1 to 3 mm diameter, black pigmented spots rather than reticulate pigmentation. Skin biopsy shows increased numbers of melanocytes that may be nested in the epidermal rete ridge system. 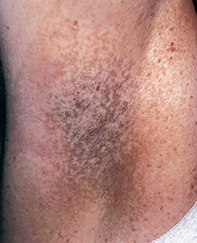 Acanthosis nigricans presents as diffuse velvety hyperpigmentation of both axillae, rather than reticulate pigmentation. Acanthosis nigricans is seen particularly as a sign of insulin resistance or as a paraneoplastic phenomenon. Skin biopsy reveals an epidermis that is papillomatous and hyperpigmented, but lacks the antler-like rete ridge pattern. Reticular pigmented anomaly of the flexures (Dowling–Degos disease) is the correct diagnosis. Skin biopsy from the axillae showed an epidermis with an antler-like epidermal rete ridge system, which was hyperpigmented and projected into the superficial dermis (Figure 2). The melanocytes were present in normal numbers and there were no junctional nests. In addition to reticular pigmentation of the flexures, pitted perioral scars and comedo-like lesions may be seen on the back and cheeks. Pigmentation may also occur over the back of the hands and in the nail folds. Some patients may also have associated hidradenitis suppurativa and, more rarely, develop squamous cell carcinoma in the areas of scarring. Mutation of the keratin 5 gene has been found in Dowling–Degos disease. There is no effective treatment for this genodermatosis, although laser therapy may be an option to reduce pigmentation. Reticular pigmentation of the axillae may represent a rare genetic anomaly that can be mistaken for a number of other processes. This article was first published in Medicine Today in March 2004. It was reviewed and updated in November 2012.